Brendan Dooley lives in Worcester, Massachusetts, and has been home schooled for most of high school. He studies with Judy Grant at the Boston Flute Academy, where he was selected as a Young Artist for the 2011-2012 school year. Mr. Dooley is also a member of the Boston Youth Symphony. 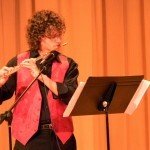 In the summer of 2011, Mr. Dooley attended a series of classes with flutist Marina Piccinini at the Peabody Institute of Music in Baltimore, Maryland. 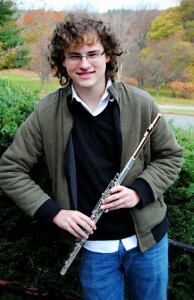 He was also selected as one of eight finalists to perform in the 2011 National Flute Association’s High School Soloist Competition in Charlotte, North Carolina. In the fall of 2011, he performed on the NPR show “From the Top” with three other members of the BFA Young Artist Ensemble. In September 2011, Mr. Dooley was featured in the Worcester Telegram & Gazette, leading up to his opening performance in the BFA’s PROJECT Trio concert. Click here to access the article.